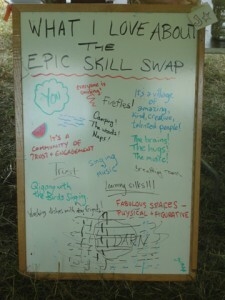 You can reach the Epic Skill Swap organizing team at epicskillswap@gmail.com. Because the camp is located in a rural setting, mobile signals are limited. If you need to contact a camper or an organizer during the weekend, you can try calling the Camp Wilmot landline at (603) 768-3350. If you’d like to receive email updates, join our mailing list.